The City has announced modifications to a city bylaw that will make it much more difficult for people to exercise their democratic right to political protest. The proposed change would regulate the use of any “structure, object, substance or thing” for a political purpose on City-owned land. Those who wish to protest will need to apply to the City for permission, at a cost of $200, and put up a deposit of $1000. Most activists and citizens movements are not funded, and these monetary requirements would essentially prohibit protests or expression by groups who could not afford it. Also, no structures would be allowed before 8am or after 8pm, eliminating the possibility for extended protests. The City claims that the change in bylaw is a response to the long-lasting Falung Gong protest that was erected outside the Chinese Embassy in 2001 and forcibly taken down by the city in 2006. The protest consisted of a small structure and several billboards with information on civil rights abuses and religious persecution taking place in China. Not only did the protest last for five years before the City ordered it taken down, there was someone at the site 24 hours a day, 7 days a week. After the city’s injunction, one protester, Sue Zhang, began an uphill legal battle against the City, arguing that the removal of the structures, which had allowed the protest to proceed safely and continuously, went against the Charter of Rights and Freedoms. She eventually won the case in October of last year. 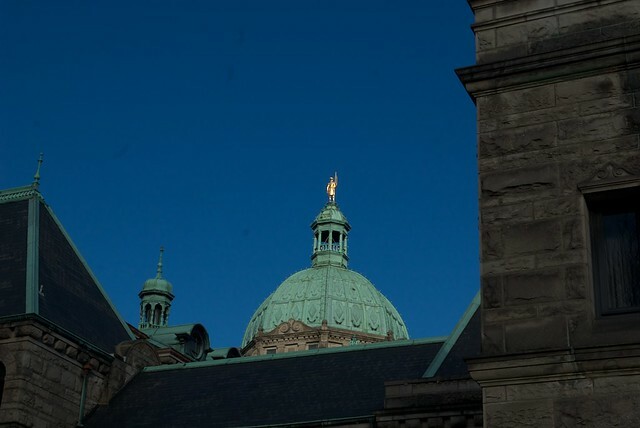 The BC Court of Appeal argued that the city’s action was unconstitutional and its bylaw on political structures was too vague. The protest was not allowed to continue, but numerous other forms city street use were allowed for other commercial and non-commercial uses. The City’s proposed bylaw changes would mean that, despite the court ruling that it was unconstitutional to remove the original structures, no further protest would be allowed outside the Chinese Embassy. Public expression will only be allowed on commercial and industrial zoned City land. The Chinese Embassy is zoned as residential. Already, several organizations have spoken out against the proposed bylaw. The Vancouver Public Space Network and BC Civil Liberties Association published a press release denouncing the proposed law. The Pivot Legal Society also spoke out against the change, pointing out that it is unconstitutional to deprive the homeless of shelter in public space. They are calling for all City bylaws to reflect the decision that was made last year by the BC Supreme Court and BC Court of Appeal to entrench the right of those without homes to access temporary shelter. Having one’s voice heard in Vancouver is becoming an increasingly difficult prospect. Yesterday, new security measures were announced at City Hall that include limiting the number of people in the council chambers during public hearings, the implementation of a ‘duress’ button for the mayor, and a registration system to record all those who attend meetings. These new measures were put in place partly because of several controversial rezonings that have been put to public hearing and have drawn large crowds. Both the proposed downtown casino and Historic Area Height Review have brought hundreds to City Hall to speak to City Council. These measures will only further intimidate those who lack the confidence to speak to City Councilors, or those who have lost faith in the municipal democracy. Over the past few years, exasperated by the City’s pro-development stance, citizens have become increasingly frustrated with City Hall. A policy such as that proposed for council tomorrow will only exacerbate the public’s lack of confidence in the process. The council meeting for this bylaw will take place tomorrow afternoon, Thursday, April 7th, 2:00 pm in the council chambers. Posted in City Hall, Gentrification, Homelessness, News, Police. Bookmark the permalink. Thank you Sean for yet another realtime report, this time on a sneak attack on freedoms in Vancouver. This particular assault ties back to the extended struggle over the nefarious provisions of the omnibus Olympic bylaw. One of the temporary victories: all of those somewhat mitigated measures were sunsetted in bylaw version two. The lesson is that the sun will never set on rapacious desires for absolute state control over public expressions of resistance. Is a human body a structure, object, substance, or thing? If all four, will it need four permits?